This is a rare collectible vintage Mughal Damascened Rajput Knife dagger/ khanjar A beautiful (Silver) hand Carving of koftgari artwork on it with excellent condition and the damascus steel blade edges has been blunt. 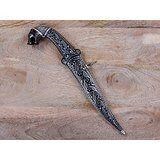 Up For Sale Beautiful Dagger Kripan with silver Koftgari work. Size - 1 Feet (Approx) Weight - 360 Grams A chance to buy the Beautiful Authentic vintage Indo Persian Mughal Dragger/Knife, directly from India.